A baseline neurocognitive exam measures an athlete's cognitive function (e.g. his ability to think) before the season, generating a score to serve as a reference point (a "baseline" in the vernacular of concussion management) against which to compare scores on tests performed after a young athlete sustains a head injury in practice or game play. This has been the both goal and intent of Neuro cognitive testing. The reality has evolved to something very consistently different and tragic, as this is one of many studies that have come to this conclusion. This is a very a unfortunate reality in high contact sports. MSG has endorsed the IPAS technology that takes not only the athletes ability to skew the exam out of the equation, but additionally removes the subjectivity of those types of testing. Currently, they still have a role as we, as a medical community, continue to learn more about this crisis. A concussion is not an event, it is an evolving process. MSG remains dedicated to providing education to application of how individuals can avoid Brain injuries and concussions, in addition to how they can be more accurately diagnosed with precision. This data and knowledge will arm more health care providers with the tools they need to make all forms of high contacts sports a much safer environment. MSG is very proud to announce another stellar addition to the group. Dr. Lara Carlson, Associate Professor in the College of Westbrook College of Health Professions at the University of New England, brings with her not only expertise across the entire landscape of strength conditioning and physiology in both the collegiate and professional ranks, but also studies she's guided that directly affects the performance of racer athletes. Holding positions on a number of prestigious boards, Dr. Carlson has given some of the most intriguing data driven talks across the country, including The International Council of Motorsports Sciences, NASCAR, and many others. She's described the “core-to-shell ratio”, related to body heat and the importance of effectively circulating blood volume. With strong ties to racing in addition to working with notable Indy car driver athletes, it was her relationship with her brother that fostered her initial interest, which has now blossomed in her becoming one of the top most sought after leaders in her specialty. We look forward to her scholarship as Motorsports Safety Group continues its united push in establishing the new standard for the safety in racing. WELCOME Dr. Carlson! TOLEDO, Ohio (March 16, 2018) -- With eight weeks off between the Lucas Oil 200 at Daytona and the Music City 200 at Nashville, ARCA Racing Series presented by Menards teams, officials and sponsors all have the chance to regroup and prepare for what is going to be a busy season, the 66th consecutive for ARCA. During this break, plans and preparations are underway by the Motorsports Safety Group regarding their continuing efforts to make ARCA, and racing in general, a safer place. Dr. Jason Cormier, founder of the Motorsports Safety Group, would like to take this opportunity to let us know that March is Brain Injury Awareness Month, a national health recognition time that is near and dear to Dr. Cormier’s everyday job. As a Neurosurgeon, Dr. Cormier spends most of his time away from the racetrack dealing with people who have severe brain and spine issues. Some of the issues are injury-related, and some are illness-related. In either case, the issues are critical, specific to the importance of the brain and spine functions in our everyday lives. A documented loss of consciousness. The person cannot recall the actual traumatic event (amnesia). Statistics from Centers for Disease Control indicatethe leading cause of brain injury is falls (35%), followed by car crashes (17%) and being struck by an object (16%). Emergency room visits due to TBI caused by falls are increasing for both younger and older people. However, if you focus only on moderate to severe TBI (those injuries that require admission to a neurointensive care unit), car crashes are the most frequent cause of TBI, followed by gunshot wound, falls, sports injuries and assault. Motorsports Safety Group is the collaboration of forward thinking minds geared toward continuing efforts that serve to foster improvements in the safety of racing. The goals of Motorsports Safety Group embody the interests of the group and its partners, ensuring the safety and health of racing teams and their loyal following. Dr. Cormier crafted this strategic partnership with the ARCA Safety Initiative Program to form a “Motorsports Healthcare Education Plan,” a high profile, interactive activation designed to reach millions of race fans throughout the country. Motorsports Safety Group, with now an international presence, looks forward to a long-term relationship with the ARCA racing family. (Feb. 19, 2018) -- The month of February is the time of year when sweethearts let their feelings be known on Valentine’s Day and when the stock car racing world kicks off its new season in Daytona Beach, Florida. February is also American Heart Month. Dr. Jason Cormier, founder of the Motorsports Safety Group, reminds each of us that heart disease doesn’t happen just to senior citizens. It is happening to younger adults more and more often. This is partly because the conditions that lead to heart disease are happening at younger ages. February is Heart Month, the perfect time to learn about your risk for heart disease and the steps you need to take now to help your heart. Heart disease—and the conditions that lead to it—can happen at any age. High rates of obesity and high blood pressure among younger people (ages 35-64) are putting them at risk for heart disease earlier in life. Half of all Americans have at least one of the top three risk factors for heart disease (high blood pressure, high cholesterol and smoking). High blood cholesterol. High cholesterol can increase the risk for heart disease. Having diabetes and obesity, smoking, eating unhealthy foods and not getting enough physical activity can all contribute to unhealthy cholesterol levels. Obesity. Carrying extra weight puts stress on the heart. More than 1 in 3 Americans—and nearly 1 in 6 children ages 2 to 19—have obesity. Unhealthy eating patterns. Most Americans, including children, eat too much sodium (salt), which increases blood pressure. Replacing foods high in sodium with fresh fruits and vegetables can help lower blood pressure. But only 1 in 10 adults is getting enough fruits and vegetables each day. Diet high in trans-fat, saturated fat and added sugar increases the risk factor for heart disease. American Heart Month is a federally designated event. The first American Heart Month, which took place in February 1964, was proclaimed by President Lyndon B. Johnson via Proclamation 3566 on December 30, 1963. The Unities States Congress, by joint resolution on that date, has requested the President to issue annually a proclamation designating February as American Heart Month. At that time, more than half the deaths in the U.S. were caused by cardiovascular disease. While American Heart Month is a federally designated month in the United States, it’s important to realize that cardiovascular disease knows no borders. Cardiovascular disease, including heart disease and stroke, remains the leading global cause of death with more than 17.9 million deaths each year. That number is expected to rise to more than 23.6 million by 2030. Dr. Cormier crafted this strategic partnership with the ARCA Safety Initiative Program to form a “Motorsports Healthcare Education Plan,” a high profile, interactive activation designed to reach millions of race fans throughout the country. Motorsports Safety Group, with now an international presence, look forward to a long-term relationship with the ARCA racing family. The Jockeys' Guild Annual Assembly, sponsored by Betfair USA, will bring together Thoroughbred and Quarter Horse jockeys from around the country December 11-12 at the MGM Grand in Las Vegas. Racing Toward A Safer Environment: Helmets and Vests with panelists which include Jeff Crandall from the University of Virginia, who chairs the NFL Engineering Committee, and Terry Smith of Dynamic Research. Dr. Jason Cormier, who was named one of America's top neurosurgeons by Consumers Research Council of America's Guide to America's top surgeons, will join the helmet discussion. After the Impact facilitates comprehensive treatment and provides support for military veterans, professional athletes and their families, including jockeys. Eric Hipple, former Detroit Lions quarterback, will speak to the assembly on behalf of After the Impact. The Guild has been able to work with After the Impact because of funding from The Stronach Group. Concussion Protocol and Return-to-Ride Guidelines, presented by Dr. Carl Mattacola of the University of Kentucky. These guidelines have been approved by the Jockeys' Guild Board of Directors, but have not yet been adopted by our industry. Dr. Kelly Ryan of MedStar Sports Medicine will address issues relating to a jockey's well-being. The Assembly will hear from other speakers and have updates from representatives of Betfair USA, the Racetrack Chaplaincy of America, Duralock, Horsemen's Track & Equipment, the Permanently Disabled Jockeys Fund, as well as an update on Jockeys' Guild member benefits. For more information on attending the Assembly, contact Jamie Carter at the Jockeys' Guild at 859-523-5625. Motorsports Safety Group is looking forward to connect with you at the 30th anniversary PRI show December 7th -9th in Indianapolis, IN. Dr Jason Cormier along with his partners and team are bringing awareness of brain and spine injury, health and wellness and the importance of athleticisim in the racing industry. TOLEDO, Ohio (Aug. 1, 2017) -- Officials from the Automobile Racing Club of America announced today that Motorsports Safety Group would be hosting the third in a series of scheduled Safety Seminars Saturday, August 5 at Winchester Speedway. 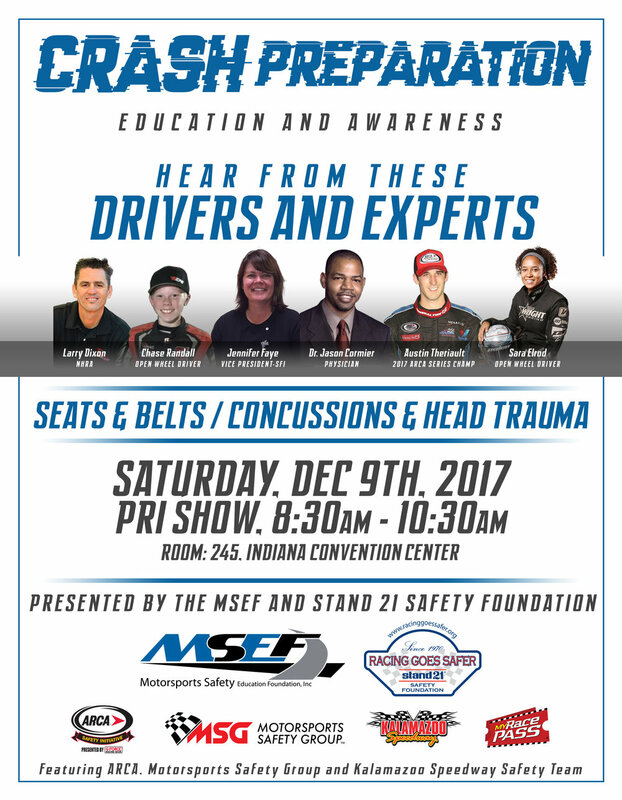 Dr. Jason Cormier, founder of Motorsports Safety Group and one of the country’s leading neurosurgeons,will present a 30-minute session at 12:15 p.m., immediately following the Saturday drivers meeting. The Seminar will include material specifically related to head injury, and preventative measures for race drivers and crew members. Attendance for all entered drivers is required, and the seminar is open to all ARCA licensed participants. ARCA Racing Series crew chiefs and car owners are encouraged to attend. Recent head injuries to drivers in the sport have inspired Dr. Cormier to host the Safety Seminar at Winchester and discuss conditions involving concussion and other types of head injury. As a renowned neurosurgeon, Dr. Cormier specializes in injury to the head, neck and spine. Dr. Cormier formed the Motorsports Safety Group during the off-season to create a means by which to promote health, wellness and preventative practices within the sport of auto racing. Dr. Cormier crafted this strategic partnership with the ARCA Safety Initiative Program to form a “Motorsports Healthcare Education Plan,” a high profile, interactive activation designed to reach millions of race fans throughout the country. The Motorsports Safety Group’s support of the ARCA Safety Initiative was announced at the Performance Racing Industry Trade Show in December of 2016. For more information, please visit www.motorsportssafetygroup.com. TOLEDO, Ohio (July 17, 2017) -- Motorsports Safety Group, in conjunction with the ARCA Safety Initiative presented by G-Force Racing Gear, wants to remind all ARCA drivers, teams and fans that July is Eye Injury Prevention Month. Protecting your eyes from injury is one of the most basic things you can do to keep your vision healthy throughout your life. According to the Center for Disease Control and Prevention (CDC), each day about 2000 U.S. workers have a job-related eye injury that requires medical treatment. About one-third of the injuries are treated in hospital emergency departments and more than 100 of these injuries result in one or more days of lost work. The majority of these injuries result from small particles or objects striking or abrading the eye. While many injuries occur at home while we are taking care of our chores like cutting the lawn, working on the family vehicle, working around the house, in the workshop, or even in the garden, most occur in a professional workplace environment. Dr. Cormier reminds us that the typical workplace for a racer is much more dangerous than the typical workplace for an average employee. Many of the 2,000 employees who are injured each day didn’t think they needed eye protection or were wearing eyewear inappropriate for the job. “Prevention is the first and most important step in protecting your eyes from injuries, so be sure to protect your eyes with appropriate protective eyewear. If you do experience an eye injury, seek medical attention promptly,” Dr. Cormier concluded. Because they help determine facial appearance and function, traumatic injuries to the eyes, mouth and face can have significant physical and emotional effects. Covering both eyes can be frightening. Stay with the person and calm, comfort and reassure him or her to help reduce anxiety. Regularly assess the person until EMS arrives.